Multicyl, Bolton, Ontario, Canada, has expanded its MLR (Multicyl Linear Rail) system for efficient and cost-effective punching of sheet and plate, angle iron, extrusions and tubing. 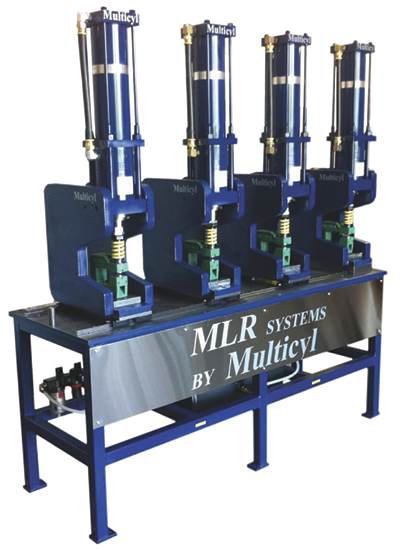 Shown here is an MLR system using four 20-ton double-acting DL series Multicyl cylinders (also new), powering Unipunch unitized tooling. Previously, the MLR system was used only with the firm’s smaller cylinders. DL cylinders are rated to 60 tons at 120 PSI, with an overall stroke to 3.5 in. and a power stroke of ½ in.